Teeth that are very badly broken, or extensively filled may need a crown to properly support and repair the tooth. A crown is a new cover for your tooth. It may be metal, metal and porcelain or more often now, all porcelain, and requires the removal of a surface layer of tooth to make room for the crown material. Generally by the time the tooth needs a crown, it is largely filling that is trimmed off. The smaller tooth now has an impression made and a crown constructed to match your natural teeth. Hi there, this is Doctor Paul, and thank you so much for watching this video of Waterfront Dentistry by Paul's. Today I would like to talk to you about a treatment option, which is crown. Now what is a crown? A crown is a helmet or an armour that sits on a tooth, circumferentially and protects it, being fragile on the inside. When you have a tooth with a large filling, be it either silver or white, over the course of time of time in the mouth it can't really stay too, too long. And this is basically because the mouth has a whole bunch of vectors. It has a lot of forces from clenching, grinding, chewing, there's a lot of saliva, there's a lot of bacteria, and there's a lot of expansion and contraction because of fluxuations in temperature that occur daily. Now this is the reason why a tooth with a large filling will eventually end up either needing a root canal or might end up crumbling or cracking. So you can be proactive and put crowns on these so that they will stay in your mouth for eternity. Or you can be reactive and end up needing a root canal and then crown it, or end up fracturing a tooth and then crown it. When you crack a tooth or when you need a root canal on a tooth, these are both expensive and extremely painful procedures. So it's all up to deciding if you want to be proactive or reactive. Now, the only two disadvantages of crowning your teeth are, the first, of course, is the fact that when you shave a tooth circumferentially you are exposing a lot of dentin. The nerve inside the tooth gets very inflamed from doing this and a lot of people, I wouldn't say a lot, but six to eight percent of people end up needing a root canal from crown preparation. Now, to put things in perspective, if you take a hundred people and you do one crown on all of them, six to eight people end up needing root canals. That's a number you can live with because if you don't do these crowns on these hundred people, regardless, there will be more number of teeth needing root canals. From a numbers point-of-view, that makes a lot of sense. The second disadvantage is if you have a cavity underneath or around a crown, which is called the margins (where the tooth meets the crown), you can't really fix it easily. You have to take the entire crown off, patch the filling up, and give yourself a new crown. Or, in some instances, the tooth is so far gone you can't really patch the tooth up. These are the only two disadvantages. Now, both of these disadvantages can be overcome. 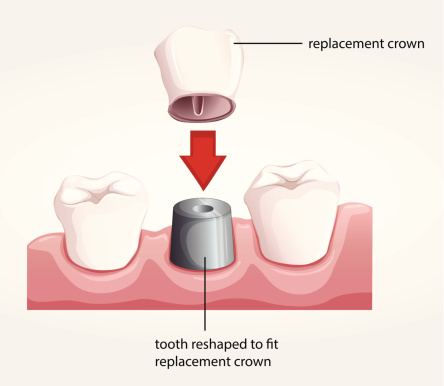 One is, while you do the crown preparation you don't have to take as much tooth structure off, and that's what is happening today, because materials are getting stronger even though they are thinner, so that takes the first equation out of the table. And the second is, if you brush and floss you don't end up getting cavities around the crown. The fact is, when you have a root canal treated tooth, there is no nerve inside the tooth, there is no blood supply, so you have a tooth which is strong but now brittle. If you don't cap a root canal treated tooth, the tooth that is root canal treated will eventually crack and crumble. And root canal treated teeth never fracture superficially, they usually fracture badly and then you have to pull the tooth out. So all the time and money you spend in the dental chair is now, pretty much, out the window. So it's all about thinking proactive versus reactive. I hope these have answered a lot of your questions. If you have any suggestions or concerns regarding what a crown is and if it is right for you, give us a call and lets see if we can answer that question.